Last week, I was the guest blogger for Jaybird Designs and wrote a piece about rediscovering crochet. Lately I have been reflecting on what appeal crafting in yarn does not only for me, but for my friends. The last time you saw the above sweater, I left a teaser about it. Well what happened was that Anna Zilboorg had purchased a beautiful cormo/silk blend in a shade of bubblegum pink during Maryland Sheep and Wool, knitted it into the lace top, noticed it was falling a bit short, lengthened it by using the same sock yarn she used in the embroidered knots, and over dyed it after deciding she did not like the color. After all that work (whew, that was one big list of steps! ), she realized that she did not like wearing sleeveless tops and offered it to me for a trade of yarn. Not a moment later, we changed that trade to The Monroe bag from Namaste, Inc., and when I arrived home I ordered her one along with a Buddy Case as a surprise. 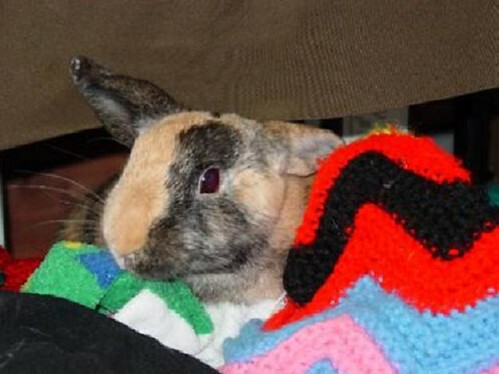 Can you imagine the similar stories that are out there for fleece, roving, yarn, and such? If you have one, I would love to hear about it by writing it in the comments section of this blog post. If you are shy, feel free to send me a message on Facebook, Ravelry, or my email address. Out of those told stories, one will win a signed copy of Anna Zilboorg’s “Magnificent Mittens and Socks” book at drawing held during my STITCHES East Pajama Party (that’s less than 4 weeks away!). If you are not at my pajama party, have no worries because I will hoppily send it to you! Now where I was photographed wearing that top is another fun story. 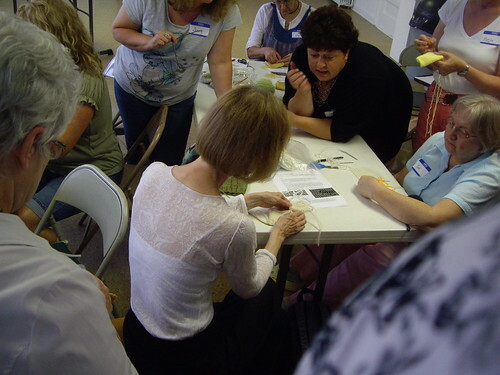 The always elegant Ann McCauley was hosting a couple of sweater workshops while visiting her family in Bedford, VA. Since Bedford was en route back from southwest Virginia, it seemed only natural that I pop in and see one of Knitter’s Magazine‘s frequent designers. Her patterns have always taken my breath away, and though I ran out of yarn for her Nautical Notes design, I am delighted that I have two of her books to help inspire me on more sweater knitting. To kick off STITCHES Midwest 2011 last month, I visited the home of the esteemed Franklin Habit. We literally “hung out” when I hosted a Google+ Hangout where a ten or so knitters were able to join us for a “video conference call” in which we talked about all sorts of fiber love, his classes, our projects, and just all out had a good time. 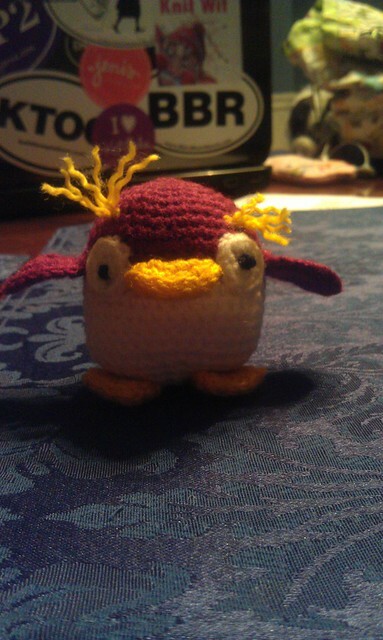 He even showed us the only bit of crochet in his home: a penguin made for him by a group of ladies in the UK. The cool Kathleen was able to snag some screen shots. 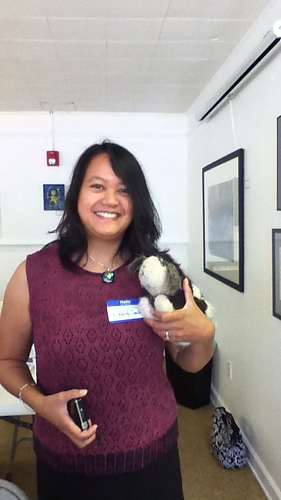 Her wonderful post on that night talks about how the fiber community has come a long way. Want to see the video I made of his awesome pizza crust making? It’s right here on my Flickr page!